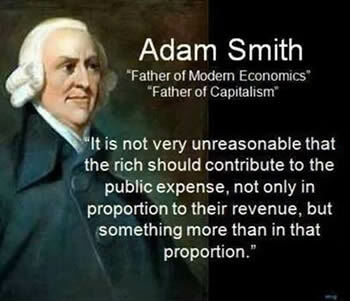 Adam Smith was born in 1723 in Scotland. He attended the University of Glasgow at age 14, later transferred to Balliol College in Oxford, England. His focus was on social philosophy. After graduating, he became a teacher and tutor. It was during this time that he developed his lectures which were to become "The Theory of Moral Sentiments." "The Theory of Moral Sentiments" was published in 1759, and went on to become the basis for another book of his, "An Inquiry Into the Nature and Causes of the Wealth of Nations" (1776), usually abbreviated as The Wealth of Nations, which is now considered his magnum opus and the first modern work of economics. Adam Smith is now titled as a moral philosopher, pioneer of political economy, and a key figure in the Scottish Enlightenment. He is single handedly responsible for developing the foundations of classical free market economic theory. His magnum opus, The Wealth of Nations, is now considered by many in the field to be a precursor to the modern academic discipline of economics. Smith and his ideas were very controversial at the time being so different in that day and age. He developed the idea of how rational self-interest and competition can lead to economic prosperity. According to Smith, government should have minimum interference and control over economic markets. He also said that there should be minimum taxation in free markets. He also claimed that there is an "invisible hand" that guides supply and demand. According to his laissez-faire philosophies, each person when looking out for themselves, inadvertently helps to create the best outcome for all. It is the concept of the butcher, the brewer, or the baker. They produce items that people want to buy; hence they get money for their items. This is the basic concept of supply and demand. They supply the products for which there is a demand. In turn, they earn money, from people who need to work or produce something else in order to earn the money; this creates a free economy with each person looking for his best interests. Smith is also credited with garnering attention and helping the development of assembly-line production methods that are driven by division of labor. According to an example he cited, a man must complete 18 steps to create a pin, hence he is able to create only a handful of pins in a week. However, if those 18 steps were done by a 10 man assembly line, then production would jump to thousands of pins in a week. Smith’s ideas were picked up and implement during the Industrial Revolution, and are often cited as the success behind the Industrial Revolution. Via the British Empire, Smith’s laissez-faire free market economic model spread around the world, even though according to his calculations, the cost of maintaining the American colonies was simply not worth the return on investment. Due to his successful ideas, and his foundation of the classical school of economics, Smith has gained a place in history as the father of economics. In fact, in 2007, the Bank of England put an image of Smith and a pin factory on the £20 note in order to commemorate him and his ideas.